Interesting poster. See more at The What Would Batman Do Blog. A lot of people have been buzzing about Barack Obama’s youngest half-brother living in a hut in Africa. What I find more exciting is the appearance of Obama’s look-alike at the Democratic Convention in Denver. His name is Gerardo Puisseaux. Until a few months ago, he was a construction worker in Miami, Florida. Since Senator Obama made his presidential bid, Puisseaux’ fortune has changed. Check out the story at the The Los Angeles Times. And, don’t be surprised if you see what looks like Senator Obama wandering around. The clue will be the absense of Secret Service agents. Some of my greatest memories were from the time I spent living in Texas. I have been over a good part of the Republic of Texas… up the I-35 corridor and going out to Houston. Well, I loved it so much that we purchased the Dwacon® Ranch in Texas. Cool stuff, eh? Well, we are not finished yet, and when the time comes to find a san antonio Realtor, we will visit that awesome directory site: clicksmart.com! This site is a great on-line resource that not only provides details on lots of great opportunities, but it also provides certified experts who are pre-screened, vetted, and guaranteed to help you get the information you need. You can begin your search for homes in Texas today! They were saying on the news that some of Hillary Clinton’s supporters may refuse to vote for Senator Barack Obama because they are upset that he won the nomination instead of her. They are saying that they would rather vote for McCain than the man who beat Hillary. The interesting thing... according to NARAL, McCain has a poor voting record in women’s issues. More of our hot designs. Click to see more! Our friend Shavar recently launched what looks to be one of the greatest resources for those in and/or pursuing the acting profession. ActorGuru.com has a growing compendium of articles and other resources for those who are destined to make their mark on the front-end of the camera. Of course, Shavar has been on screen with Hollywood’s créme of the crop since he was a lil’ G and continues to break new territory both in front of and behind the camera. Make sure you bookmark ActorGuru.com! I recently saw this great movie, The Dead Girl, not knowing exactly what to expect. The movie started slowly and almost innocuously and built slowly. It was like watching a chef take flour, eggs, milk, sugar and other ingredients and watching them mix and cook and decorate until finally you have a delicious cake to savor. The Dead Girl is that cake and if you have not seen this film... I highly recommend adding this to your collection! I remember her understated performance as Robin in the underrated ABC series, Heart of the City. That was long before Kelly Bundy... way before the babysitter died... but it was the role that first brought the immensely talented Christina Applegate into the public eye. And now, it is a more grim reality in which Christina brings every woman’s concern into the public eye. As reported in the Showbiz Spy, Christina has become a crusader against breast cancer. Sadly, USA Today and other news outlets reported that Christina recently underwent a double mastectomy after receiving her own diagnosis. And now, she faces the challenge of reconstructive surgery, which Deborah Kotz has blogged about at U.S. News and World Report. Our prayers are with you, Christina. Stay brave! Stay strong! Usually, a movie goes out and a year or so later there is either a sequel (if it is a blockbuster) or a straight-to-DVD sequel. The current hit film Get Smart is still in theatres and already there is a direct-to-DVD sequel available for one and all. Masi Oka and Nate Torrence recreate their roles as CONTROL nerds in their own adventure. Read more about it (and hear some kewl sound clips) at Fresno Bee or get full details at IMDB. He composed and performed perhaps the greatest movie theme of all time... the theme from Shaft. He brought Truck Turner to life. He voiced “Chef” in the infamous cartoon series South Park. The Oscar®, Grammy, and Golden Globes winning polymath was found unresponsive near a treadmill in his home. He was 65 years old and still working in Hollywood. You can read details about this genius at The Los Angeles Times. Also, check out his IMDB Page. Two Bernies have left us... but the loss of Bernie Mac hits hard. We have enjoyed him as one of the Original Kings of Comedy, Jangle Leg from the Eddie Murphy film Life, and in his Fox television series. Bernie had been suffering from a number of health issues and when we heard that he was dealing with pneumonia, we assumed that he would make a quick recovery. Check out Thomson’s Variety.com Blog for more... and remember to send up a prayer for Bernie’s family and loved ones as they deal with their loss. And, if that ain’t enough, Brillstein produced movies including The Cable Guy, Happy Gilmore, The Blues Brothers, both Ghost Busters. Well, according to an article on MSNBC, there are a few problems with that picture. First, “Free Credit Report dot Com” is not exactly free. In fact, it requires a credit card that, if you are not careful, will get charged $12.95 over and over, in perpetuum. In fact, the place to get your free credit report is not “Free Credit Report dot Com” but, rather, AnnualCreditReport.com. If that isn’t enough… check out Bob Sullivan’s Blog. And, then… check out lifelock, an identity theft prevention tool that doesn’t use cheesy commercials. Maybe They Were Going To The Piggly Wiggly? There was a lot of speculation from the pundit’s gallery about the car crash that injured Oscar® winner Morgan Freeman and Demaris Meyer. The good news is that Freeman was released from the hospital in seemingly good condition. However, curiosity continues to run rampant over whether or not any hanky panky was going on between Freeman and Meyer. Another monkey has appeared in the wrench... in the announcement that Morgan Freeman will be divorcing his wife of 24 years, costume designer Myrna Colley-Lee. I guess we will have to wait for Harvey Levin to break that story on TMZ. You can click here to see the ABC News video and here for Reuters video -- both providing more details. Ah, yes… those school days. School days. Dear old golden rule days. Reading and writing and ‘rithmetic… taught to the rule of a hickory switch. Okay… that is obviously from some archaic generation. Still, I can’t help but remember my old buddy Quentin and our shenanigans in first grade. Basically, if Quentin was David Letterman, then I was Justin Stangel. Well, we thought that we were the funniest thing since Steven Colbert when, one day, our teacher announced a special guest. Quentin’s dad came in with a belt (which ostensibly is softer than a hickory switch) and gave Quentin a career change (from class clown to valedictorian). Okay, so those early memories may not have been the most pleasant… but they set the course to the success we have seen in life. But it is still so wonderful to remember going to school… having the coolest outfit… holding hands with the cutest girl… ah, sweet memories! One thing that I hated was having some cool thing and then discovering it stolen. I would have loved to have had one of those cool Dymo label makers to put Color labels on everything. I would put “this ain’t yours jerk… give it back” on my school supplies. I would put “she belongs to me” on my girlfriend’s shirt. She would put, “LOSER” on my forehead. We read in the Los Angeles Times about the sentence handed down to Salim Ahmed Hamdan, Osama bin Laden’s former chauffeur. 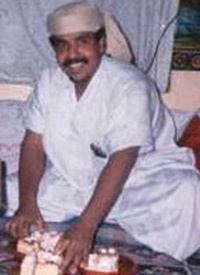 In America’s first war crimes trial since World War II, Hamdan got 5½ of the 30 years requested by prosecutors. Too heavy? Too lite? Let the pundits chime in! Propublica questions how being a driver constitutes a war crime. Well, we won’t be shedding many tears for Mr. Hamdan. After all, his sentence is much lighter than what kids in the hood get for selling crack. As a kid, we were too broke to afford air conditioning in my dad’s car. But Pop, being a proud man, didn’t want anyone to think we were poor. And so… to keep up appearances, we rode around with the windows rolled up. And we would arrive at our location looking as if we had spent an hour in a sauna… wearing our clothes! When I purchased my first vehicle, it had everything except the air conditioning compressor. I don’t know what I was thinking… but after driving around under the hot Texas sun for a few days, I was ready to plunk down the money to get what I needed. Years later, when my a/c compressor died, I was desperate to find auto ac parts to get cool air back. If your a/c goes bad, you can visit http://www.discountacparts.com/ to find the exact parts for your vehicle. Have you heard the item on Fox News about Paris Hilton’s mother slamming John McCain for using her daughter (and Britney Spears) to slam Barack Obama? If not... check it out! Or, maybe he will say he was simply having a Senior Moment. Check out The TV Squad for some great television people who have exited the planet. Many people boo-ed when Congress voted to take a vacation, leaving many important issues unresolved. However, one thing that they did accomplish was to offer an apology for something that happened in the 1800’s. This apology for slavery and for the injustices that occurred under the oligarchical system known to many as Jim Crow. CNN provides a bit more expository on the aforementioned. That act may seem too little too late for some. Specifically, Senator Obama feels that actions need to accompany those words. On a side note, my cousin Congressman John Conyers has been trying to get a bill passed in that regard... and it will likely die on the vine. Mapping Out the City with "New York Geographies"